"I was lying in bed, watching TV as usual, when I saw a technology special on a mobile robot. I immediately imagined controlling it as a surrogate for my own body." Those are the words of Henry Evans as he describes how our project on assistive robotics, Robots for Humanity, first began in October 2010. As a result of a brainstem stroke, Henry is mute and quadriplegic. Following extensive therapy, he regained the ability to move his head and use a finger, enabling him to use a computer. When Henry saw a television interview with Georgia Tech Professor Charlie Kemp showing research with the Willow Garage PR2, he immediately saw the opportunity for people with severe motor impairments to use mobile manipulators as assistive devices. 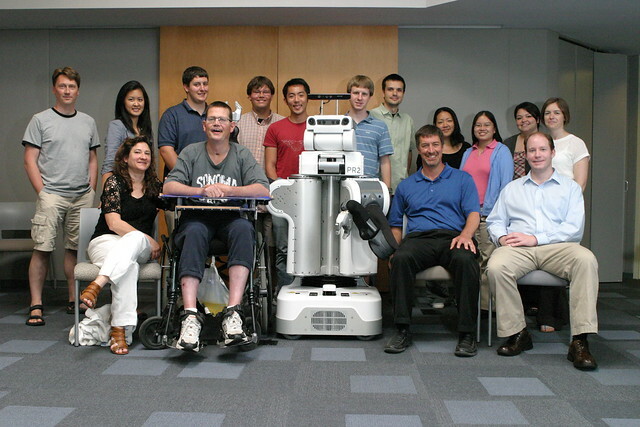 Henry is motivated by the possibility of using a robot as a surrogate for his paralyzed body, and he believes thousands of others with severe motor impairments could benefit as well. Robots for Humanity, a collaboration between Willow Garage, Georgia Tech, Oregon State and Henry and Jane Evans, was recently featured on CBS Evening News. In October 2011, Henry gave Halloween candy to children through the PR2 robot at a local mall. As a child would approach the robot and hold out his or her candy bag, Henry would command the robot to pick up a candy from the side table and then place it inside the child’s bag. In Henry’s home, he has demonstrated navigating the robot through his home to find and deliver to himself objects such as a towel from a drawer in the kitchen, and small food items from inside the fridge. One of Henry's very first accomplishments was to manipulate the PR2 to scratch his own nose--the first time he had been able to do so in over a decade. Since then, Henry has not only used the PR2 to shave himself, but also tele-operated a PR2 located at Georgia Tech and shaved Prof. Kemp remotely. The Robots for Humanity team at Willow Garage is led by Matei Ciocarlie and Kaijen Hsiao. Their approach is to research and develop a diverse suite of open source software tools that blend the capabilities of the user and the robot. This has resulted in what is, to the best of our knowledge, the first example of a mobile manipulation platform operated by a motor impaired person using only a head-tracker single-button mouse as an input device, and used for varied and unscripted manipulation tasks in a real home as well as limited forms of social interaction. The goal of putting robots into real homes to help people with disabilities is a long-term vision for our project. By actively involving the users, Henry and Jane Evans, in our participatory design process, we have made tangible progress towards assistive capabilities that are both useful and usable. We also anticipate that by putting robots into the real homes of people with disabilities early and often, we can better direct our research to overcome the real-world obstacles to the use of mobile manipulators as an effective assistive technology. Our future challenges include enabling Henry and Jane to use a PR2 in their home for longer durations, and evaluating our methods with other people with motor impairments. More information on the project and associated open-source code can be found here.